Thinking Out Loud In Sturbridge gets all sorts of comments. Some immediately after the an article is posted, some months later. The comment at the far bottom is one I received a couple of weeks ago on a posting I wrote about the Chowder Festival at the Public House last winter, it reads, "Great blog, more wine reviews please". Well, first of all, thank you for the compliment about this blog. I like it, too. As far as wine reviews go, well, That's not what I do. I am not wine savvy. I 'd like to know more, and I am learning. I did stop by the new Wine Buyers Outlet on Main Street here in town a couple of weeks ago, and left knowing more than I did going in. I do try wines when recommended by friends, and when I like them, I will recommend them to others. Since you offered a compliment about this blog, I will reciprocate and recommend a wine we tried a few weeks ago. Recently, our brother-in-law, Paul, a man with exquisite taste, recommended a white wine that he enjoyed a great deal. The wine is named, "Conundrum". The reason for that puzzling name is that the wine is a proprietary blend of wines that one would never expect to work together, and the exact ingredients are not shared by the vineyard. A real conundrum. The wine is excellent. 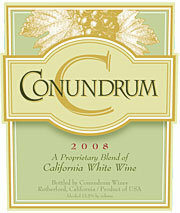 If you would like to learn more about this excellent wine, check them out at conundrumwine.com. So, as far as wine reviews go, well, that's it. Now, it's your turn to share one with me, and next time I'll share with you all I know about Boones Farm Strawberry Hill wine. "The wine is named, "Conundrum". The reason for that puzzling name is that the wine is a proprietary blend of wines that one would never expect to work together, and the exact ingredients are not shared by the vineyard. A real conundrum." Is the Boone's Farm Strawberry Hill Wine actually a "strawberry" wine? Wouldn't that be sweet, and delicious soaked up in a sponge cake?! Oh, it sounds so good! That's what I would call a fine wine! I do like the idea of the sponge cake, and if I had the forethought to do that when I was 18 I may have saved my self a lot of pain the following mornings. It's sounding quite good. It might be nice in ginger ale, or with the aforementioned sponge cake drizzled in strawberry wine with a scoop of vanilla or strawberry ice cream on top, or how about a pina-colada mixed with strawberry wine? Hey, Wally, times are tough - how about you doing a strawberry wine budget cookbook? !